Maqui berry (aristotelia chilensis) is the newest and greatest super fruit obtained from pollution free environment of the remote mountainous regions of patagonia of southern chile. Consumed by local mapuche indians for centuries, maqui berries have become known as a 'super fruit' because of the extremely high levels of antioxidants. 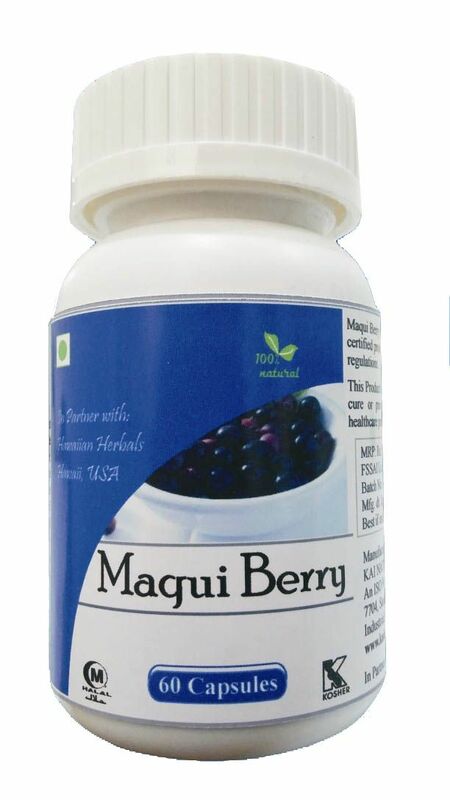 Maqui berry capsules is a halal & kosher certified product & produced under international gmp regulations. Key ingredients: it contains maqui berry (aristotelia chilensis) extract which is an excellent source of vitamin a, vitamin c, potassium, iron, and calcium and also contains high levels of antioxidant, anti-inflammatory and immune supportive properties. Potent anti-inflammatory activity, help to reduce the risk of a variety of degenerative diseases that involve inflammation, also inhibit the growth of cancer cells, rich source of antioxidants, prevent the oxidation of cholesterol in the blood, reduce the risk of cardiovascular disease, including heart attack, stroke and hardening of the arteries, help to suppress blood glucose, can prevent from diabetes, boost energy and preventing the formation of new fat cells thus may prove to be a beneficial aid in weight control, boost natural immune system functioning, directions for use: take one capsule twice daily on an empty stomach or at least half an hour before morning and evening meal. For better result, continue to use for 6-12 months.